Nate, a 19-year-old film student, and Margaret, a 52-year-old spinster with a coffee mug addiction, are best friends in an odd, quirky, totally working kind of way...until Nate's audacious classmate Darla sets him up on a date with James. Nate's new romance shakes up his friendship with Margaret, who goes off on her own to pursue her lifelong dream of being a stand-up comedian. As Nate and Margaret attempt to navigate their new lives apart, they come to realize just how important true friendship really is. Nate & Margaret, Nathan Adloff's tale of friendship and growing up, falling in love and falling apart, shows how to unlikely friends will push the bounds of their relationship to make each other happy, all the while coming to terms with their own faults and dreams. Starring noted television actor and theater performer Natalie West (Roseanne, Bushwhacked), Tyler Ross (The Wise Kids), and Gaby Hoffmann (200 Cigarettes, Now & Then), Nate & Margaret shows that age really does not matter in the grand scheme of life, love, and friendship. Directed and co-written by Nathan Adloff, star of Blackmail Boys, Nate & Margaret is a tale as old as time, but a fresh twist as a 21st century gay Harold and Maude. Described by the late Roger Ebert as "a smart, observant movie about two very particular people," by Slant Magazine as "generally a wonderful rom-com, as funny and emotionally robust as any other" and by the Big Gay Picture Show as "no Harold and Maude, but it’s fun, entertaining and feels fresh, eschewing big, cheap theatrical scenes in favour of concentrating on character and emotion." 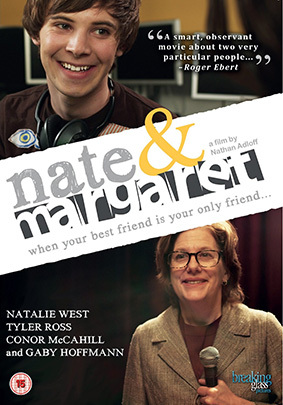 Nate & Margaret had a world premiere as the closing night film in the FilmOut San Diego LGBT Film Festival, screen in the Vancouver Queer Film Festival, and enjoyed theatrical runs at the Gene Siskel Film Center in Chicago and at Brooklyn's reRun Theater in 2012. Nate & Margaret will be released on UK DVD on 8th April 2013 (yep, next Monday) by Breaking Glass UK at the RRP of £15.99.